Home Brushes	Would you like some cream in your Highlighter ? Would you like some cream in your Highlighter ? When I started to use make up, I did not even know what a highlighter was, I discovered highlighters only 2 years ago but since then, I use them on a daily basis, either in a subtle way for a day at work or more dramatic for other evening events or parties. I love both powder and cream highlighters but due to my very dry skin I tend to use the cream ones more often. They also make it more easy to travel with since they are not powder, they will not shatter and you can just keep them in your checked luggage. I find cream highlighters more long lasting and that is also why I would pick a cream over a powder one. Whatever your reason is, everyone should give them a try as they really deliver ! My expectations from a cream or a powder highlighter are the same, cream or powder, they have to last, they have to be easy to use and I like shine but not big chunky sparkles. Estee Lauder “Modern Mercury” is from the fall 2011 collection. It is a gel texture, no glitters, just shine. 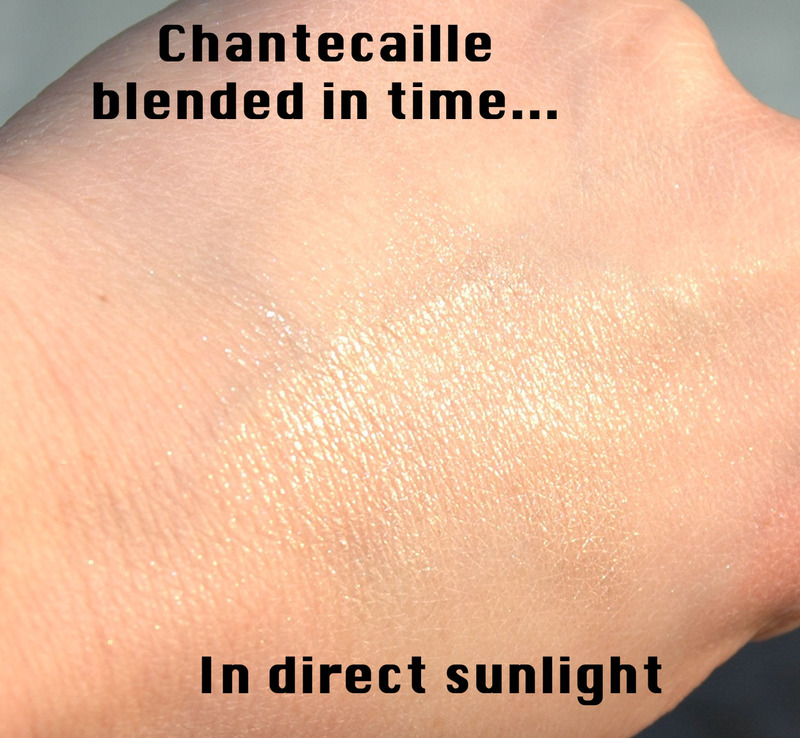 This highlighter has so many easy uses, face, eyes, lips, nails…. If you managed to get your hands on this one, go have a look at Dustin Hunter’s video on Youtube and you will be amazed. The color is a gorgeous metallic peachy-gold. Use it wet for an intense application or blend it well for an all over glow. I am really looking forward to the summer to apply this on the shoulders and decolleté ! 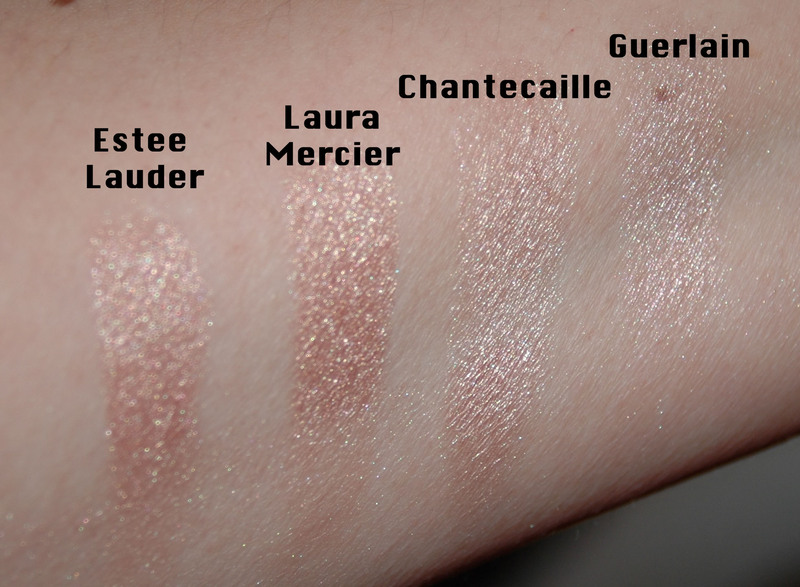 Laura Mercier “Rose Rendez-Vous” is from the 2011 holiday collection. The color is a gilded bronze with a champagne shimmer, no sparkles, just fabulous shine. Guerlain “Cruel Gardenia” is from their spring 2012 collection. My favorite highlighter for an everyday wear. 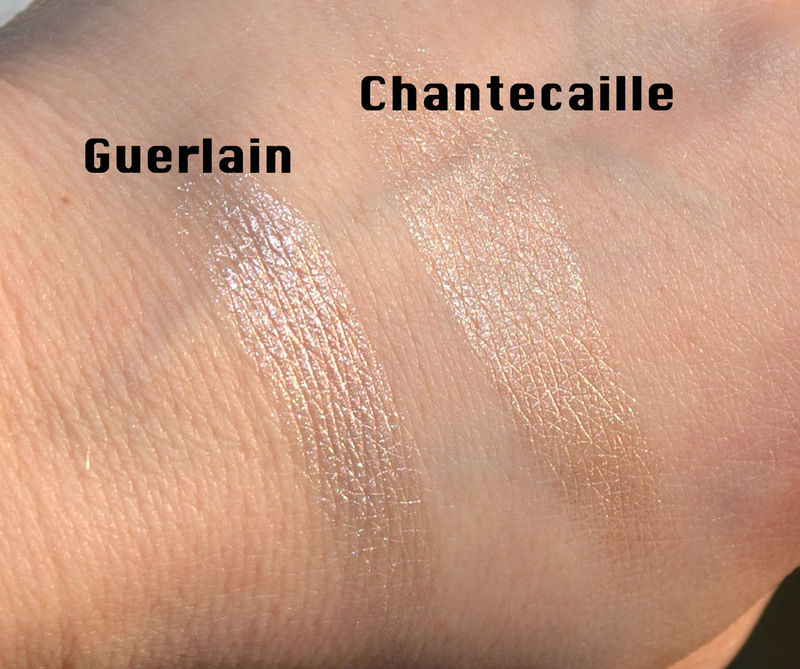 For an all over glow or only on top of the cheekbones, there are tiny sparkles but very subtle. From all of these highlighters this is the most universally pink flattering shade. My only problem with this one is that one day, when you are in a hurry, you will kick the flower with the lid… done it, and will do it again… poor packaging design for such a great product. Chantecaille stick in “Radiance” is just the best for high impact long-lasting and precise application with a small brush. No sparkles and only work appropriate if you blend it well. This is like glue on your cheeks, it will last all day and night, for sure, but needs some work and blend it as soon as you apply it otherwise it will be too late !!! The darkest on my skin are the Estee Lauder and the Laura Mercier. Honestly I cannot really see a difference between these two, they are so similar on my skin ! The Chantecaille can be very dramatic, make sure you blend it well and quickly after application as it settles in seconds. 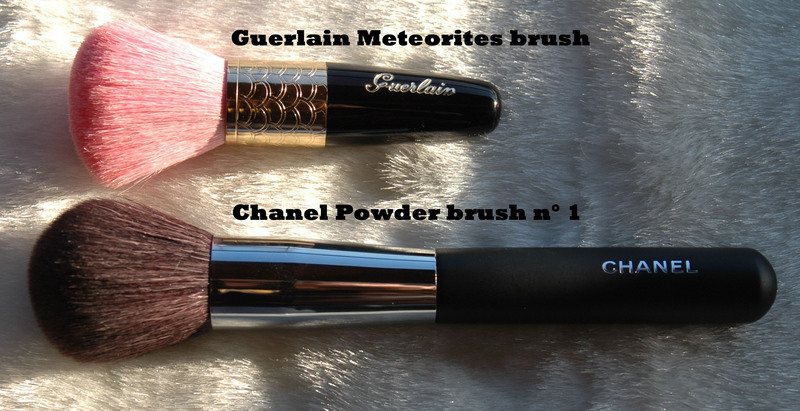 The Guerlain is very subtle and on me, I use it very lightly all over the face and apply it with a big brush. 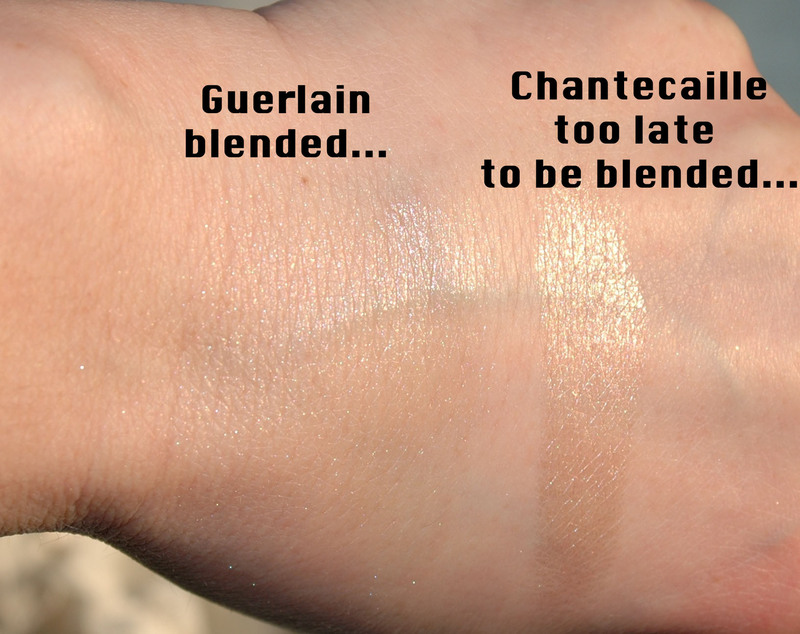 If you look at the picture below, I have rubbed the bottom of the swatches and the Chantecaille stays put. And see what happens if you don’t blend it immediately… It will just stay exactly where you put it ! 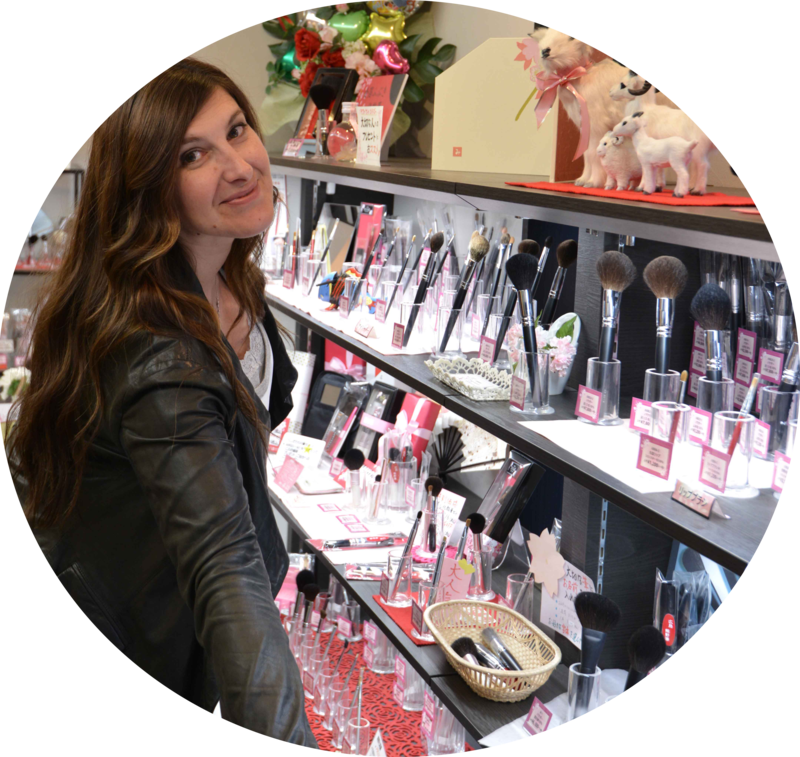 If blended on time, you can apply it all over the face. I don’t like to do that since I prefer a subtle glow but I tried that and it works. Just take your big face brush and pick some product with the brush, then apply some on the cheeks and finish with the rest of the face, don’t press the product, just dust it lightly all over the face. The options are huge depending on the result you want to achieve. For an all-over glow I like to use these brushes because the bristles are stiff enough to blend the cream product perfectly. 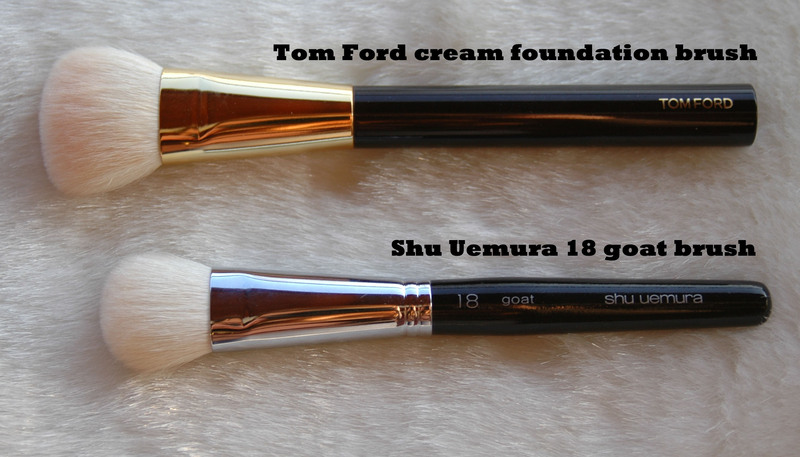 For highlighting the cheek bones or nose I would use a medium brush like for example the Tom Ford or the Shu Uemura. 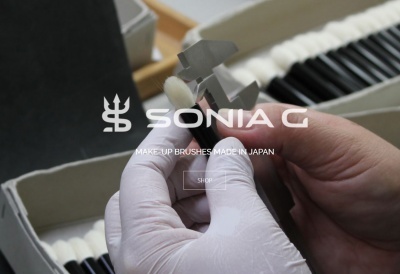 For the cupid’s bow or the inner eye corner, I would use a smaller pointed brush like the N°7 or the Chanel 24. 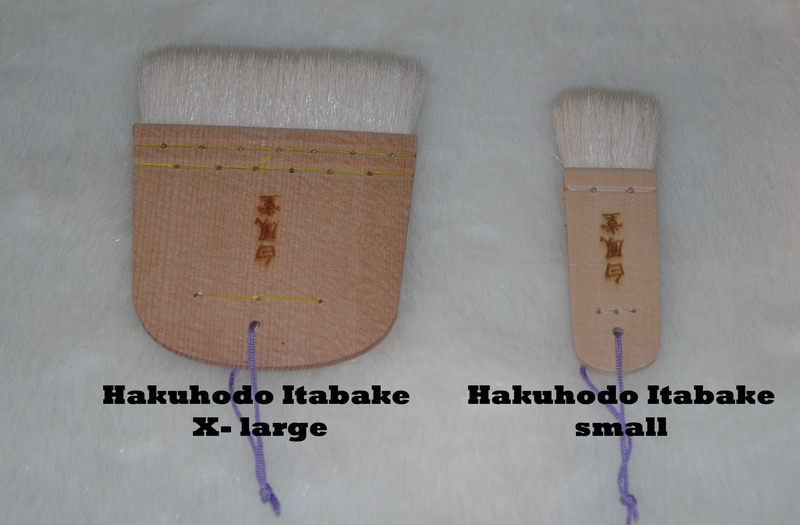 And if you want to blend your highlighter very precisely, you can try the Hakuhodos for example, absolutely perfect for that purpose ! If you love high impact highlighters, all these are must-haves. 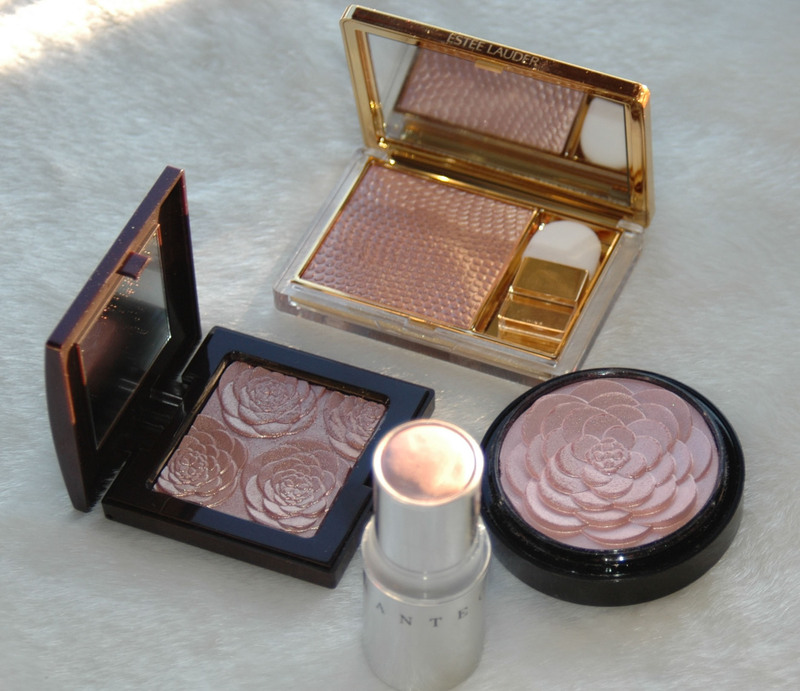 My favorite is the Guerlain since it is the most work appropriate and has the most beautiful finish, I can use it every single day, in the sunlight or under artificial light, it always looks perfect ! Would you like some cream in your Highlighter ? was last modified: August 4th, 2013 by Sonia G.